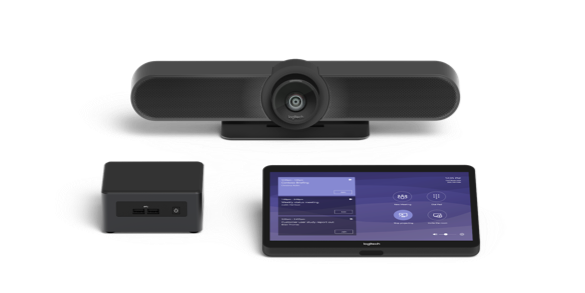 When we first unveiled Logitech SmartDock (part of Project Rigel) at Microsoft’s Keynote at Enterprise Connect 2016, Logitech showcased our commitment to modernizing the meeting room: delivering the Skype for Business experience, one-touch join, and high quality video at a fraction of the cost of traditional video conferencing systems. SmartDock was the first Skype Room Systems solution in the market, and we have maintained our market leadership ever since. We have continued to innovate, such as with the introduction of Logitech SmartDock Flex last year to simplify deployment. We’ve been privileged to serve an incredible number of global customers, some of whom have deployed the solution to thousands of their meeting rooms. Today, we advance Microsoft meeting room environments even further with the announcement of Logitech Tap. Tap is our latest solution, and it truly democratizes teamwork in meeting rooms. Designed from the ground up for Microsoft Teams Rooms, Tap leverages our market experience to streamline and simplify the deployment and use of video conferencing in any meeting room. As an integral component of Logitech Room Solutions, Tap couples the purpose-built utility and robust build quality of a meeting room touch control panel with the affordability and flexibility of a tablet. It delivers one-touch video calling and simplicity for users in an IT-friendly design ideal for deployment at scale. Over two years ago, Logitech partnered with Microsoft to deliver the first Skype Room Systems v2 solution. Now with Logitech Tap for Microsoft Teams Rooms, we are excited to see Logitech enabling customers to easily and flexibly extend Teams meetings into every space, from small huddle rooms to boardrooms. Teams Rooms solutions like Logitech Tap provide a consistent Teams experience and are core to helping organizations get the most out of Teams meetings. We appreciate Logitech’s work in bringing Teams intelligent meetings and great collaboration experiences to our joint customers. Logitech Room Solution Packages for Teams Rooms include all necessary components in one package: the Logitech Tap touch controller, a Logitech conferencecam system, and a small form factor computer pre-installed with Teams Rooms. These solution packages are planned to be available globally from Logitech distributors and resellers in Spring 2019. The packages are expected to be priced around $3000 for small rooms, $4000 for medium rooms, and $5000 for large rooms. Customers with existing SmartDock systems will be able to upgrade by purchasing a base package of Tap with small form factor computer. Logitech Tap is on display this week in Amsterdam at ISE 2019, the world’s largest AV and systems integration show. Visit Logitech at booth 11-C110 to see Tap in action. You can also pre-schedule a meeting with Logitech by clicking here.